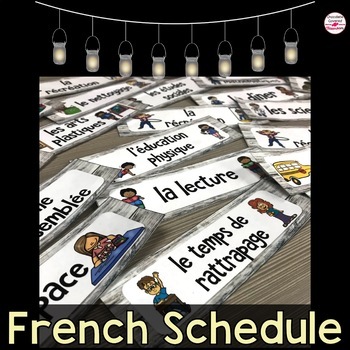 These natural looking French Schedule Cards can be used to create a beautiful magnetic or pocket chart display for your students. Each card has a natural white wood background and colorful clip art. This set comes with over 60 different schedule cards. These schedule cards are perfect for second language classrooms because pictures accompany the words. In this manner, even if a student doesn’t quite know how to read French, they can still figure out the meaning of the word based on the pictures. These cards would also be ideal in a primary French Immersion classroom. I included a variety of diverse children in the cards. You can choose to place magnets on the back of the schedule cards and display them on your white board or to put them into a pocket chart. 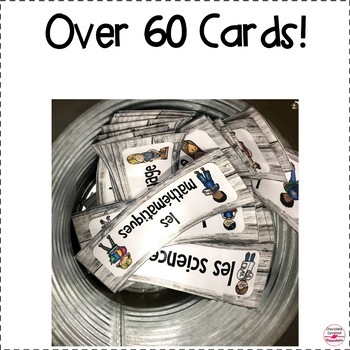 I have even seen teachers who simply sticky tack the cards to the wall. When students know what to expect, days go a lot smoother. One of the French as a Second Language outcomes in the Alberta Program of Studies is to familiarize students with the names of different subjects and classes. This schedule board is a perfect way to teach students this vocabulary while getting them prepared for the day. If you teach in the upper grades, I suggest having a student change this board for you. 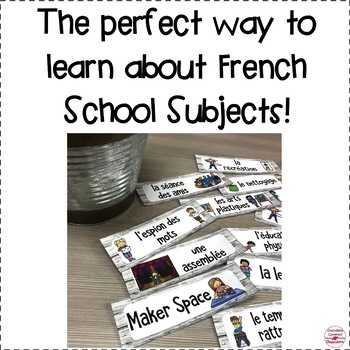 It will make your life a lot easier and gives them good practice with their French vocabulary! Don’t forget to check out my other classroom décor products!